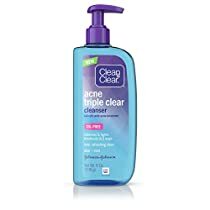 Fight acne and soothe your skin with Clean & Clear Acne Triple Clear Cleanser. Can be used on all skin types, this daily facial cleanser fights pimples in three different ways: it removes pore-clogging oil, treats breakouts while soothing your skin with its aloe and mint formula, and helps prevent future breakouts. The acne facial cleanser is an oil-free formula that contains Salicylic Acid, it leaves your skin looking clearer and feeling refreshed.